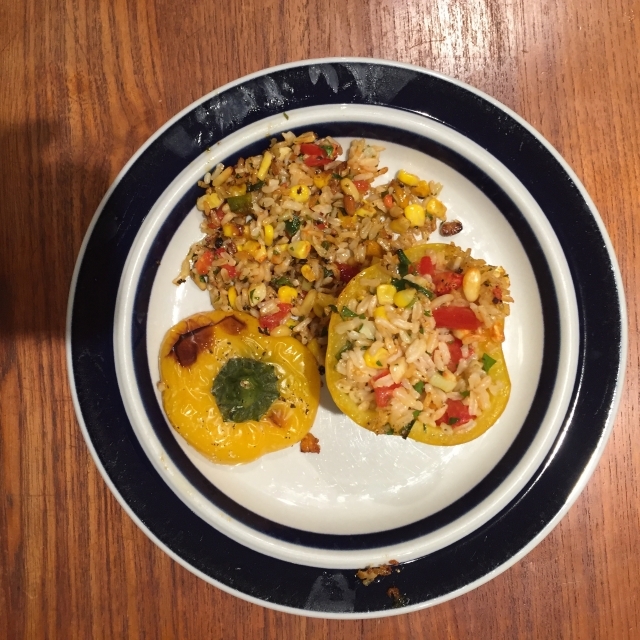 A vegetarian meal of yellow or red peppers, stuffed with Rice, Corn and Tomatoes. Prepare the peppers by halving, if making 4 portions, or by cutting off the top quarter of each pepper and saving the tops as hats, if making 2 portions. Then seed and de-vein. Cook the peppers in boiling water for 5 minutes. Drain, pat dry and set aside. In a bowl combine the cooked rice with the cooked corn and set aside. In a skillet, heat 1 tablespoon of butter over medium heat, cook the onions and garlic stirring, for about 3 minutes or until softened. Stir into rice mixture. Stir in tomato, tarragon, pine nuts, salt, and pepper. Taste and adjust. Spoon the rice mixture into the pepper halves. Arrange the peppers into an oiled shallow baking dish in a single layer. Drizzle with the remaining butter. (Recipe can be prepared ahead to this point and refrigerated for up to a day). Bring to room temperature. Bake in a 375-degree oven for about 20 minutes or until heated through and peppers are tender.